Last week, Germany published strong data on key indexes that supported the European currency, and EUR/USD reached the key resistance level and local high at 1.1000. At the end of the last trading week, the American currency re-appreciated against the Euro against a backdrop of positive statistics for US labour market and weak data on the eurozone's loan sector. EUR/USD clawed back a part of lost positions after yesterday's fall. The dollar was supported on Tuesday after publication of statistics for US inflation. Core consumer price index grew by 1.7% year-on-year and by 0.2% month-on-month. Both indexes were higher than expected. Today, market participants are waiting for February's data on US durable goods orders that are forecast to decrease. Gold quotes continue to rise slowly as Fed failed to provide information on the dates of an interest rate rise at the latest meeting. An important resistance level is at 1200.00 and coincides with M200 moving average. If the price consolidates above it, it may continue to grow to 1250.00-1265.00. Let’s look at the four-hour chart. Tenkan-sen line is below Kijun-sen, they are both turning downwards once again. Chinkou Span line is below the price chart; current Kumo-cloud is descending. After another correction the pair resumes its movement towards the level of 1.4685. The closest resistance level is Tenkan-sen line (1.4800). This week the pair USD/JPY was testing the level of 122.00, but couldn't overcome it. Today the pair is being corrected due to the positive stats on Japanese indices: Consumer Confidence increased by 1,6 points, exceeding forecasts, while Tertiary Industry Activity index reached the peak since March 2014. AUD/USD quotes have been dropping since Friday when strong statistics for the US labour market were published. The NFPR indicator exceeded forecasts substantially. The Australian dollar is also badly affected by the problems of Australia's important trading partner - China. The Chinese industrial production index has dropped to a record low at 6.8% since 2009. Let’s look at the four-hour chart. Tenkan-sen line is below Kijun-sen, they are both horizontal. Chinkou Span line is below the price chart; current cloud is descending. 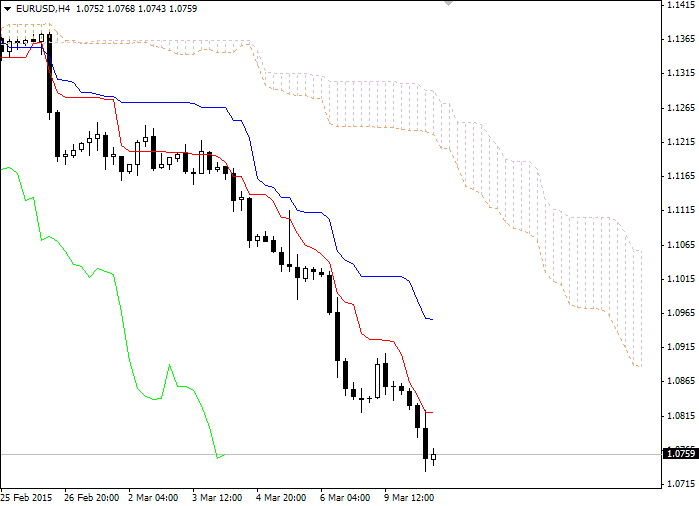 The pair is trading within the downward trend and is moving towards the level of 1.7015. The closest resistance level is Tenkan-sen line (1.0820). All major currencies, including the pound, were under pressure on Wednesday owing to the dollar strengthening against a backdrop of US upbeat statistics. Besides, UK service sector PMI dropped to 56.7 despite positive forecasts of 57.6. Brent crude oil quotes rose above a level of 62.00 on Friday, reaching a maximum at 62.66 due to the fears that gas supplies from Russia to the European Union would be hampered. The situation had been caused with Ukraine failing to pay its fuel bill, while being the main gas transit country. A meeting between Russia and the EU concerning the issue is to take place today.